The Stelvio National Park, one of Europe's largest protected areas covering 134.620 hectares of central Alpine territory, straddles two italian regions: Lombardy and Trentino Alto Adige. 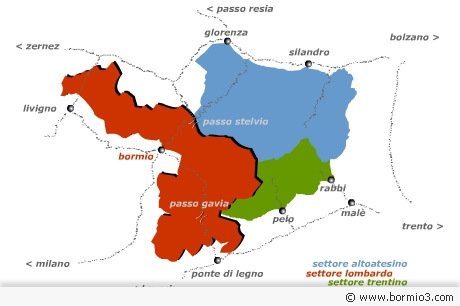 The idea to protect the area in the italian alps was first proposed at the beginning of the 20th century, although the law creating the park was not approved until 1935, and only as recently as 1977 were its present borders defined. The scenery of the park, which ranges in altitude from 650 to 3905 meter (the Ortles mountain peaks), includes glaciers, alpine pasture, extensive woodland, agricultural holdings with farmsteads inhabited all year round, glacial lakes and mountain streams. In addition, thanks to the differences in level and morphological variety of the land, the area boasts a varied ecosystem rich in some quite remarkable flora and fauna. In summer, expeditions varying in difficulty are organised along the park's footpaths. Visits often take a particular theme, such as local history, geology, botany, architecture and wildlife, or are organised as photographic outings. Plenty of specialised activities are carried out in the Stelvio Park: the Rhaetia Alpine Botanical Garden, originally set up to collect and preserve the various species of Alpine plant life in the park, also grows many species from the world's other mountain regions; and guest accommodation is provided at various points throughout the park, which can also cater for groups and associations, who should contact the parks's offices beforehand. The Lombardy section of the park lies in the provinces of both Brescia and Sondrio.